Why does Fakebook continue to allow such obvious fraud on their site? Any person, no matter who you are can take a bad picture. 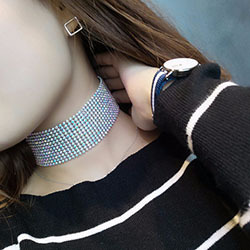 In fact most people don’t realize but those seemingly simple selfies posted by celebs you see on their social media site are typically 1 photo out of a batch of 20 or 30 that they took, to find just the right shot. So can you really believe what you see? Well … as the saying goes, a picture is worth a 1,000 words. But can we actually believe any of those words? Today I read an article on Facebook. I couldn’t believe my eyes when I saw the picture of Lindsay Lohan. 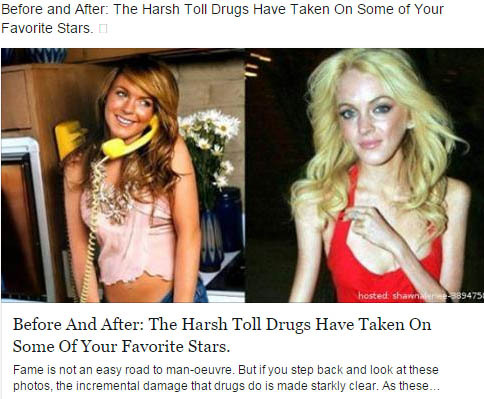 If you were to believe this story, just by the photo alone, you would think Lindsay Lohan looked anorexic and had a serious drug problem which caused her to look the way that she does. Now here is the problem, how did she lose so much weight when just the other day she was in London at some charity event and clearly looked nothing like the photo you see above? Well it turns out that company took the photo you see below and photoshopped it to make Lindsay Lohan look like a skinny crack whore. While she is obviously thin, that’s the norm in Hollywood. But she isn’t like you see up there. See the difference? What bothers me is that Facebook continues to allow such blatant fraud to be posted on their website in the first place. Those people clearly modified the picture in an attempt to make you want to click on it to see what was wrong with Lindsay Lohan. By the way, if you were wondering, here is what Lindsay Lohan actually looks like right now. She recently attended the Elle Style Awards. As you can see she looks healthy and nothing remotely like the faked picture from that Facebook advertisement. I don’t know about you but I’m personally getting tired of all the Facebook fraud. Every time I turn around there is something new like this going on and Facebook clearly has no plans to stop it because they are making far to much money off of the ads of these fake or fraudulent stories in the first place.